Get ready for your chance to win big playing the WMS-powered Monopoly Big Event slot. This super game will not only impress lovers of the renowned Hasbro game, but is also bound to intrigue video slot enthusiasts with its three amazing bonus features and its maximum 250,000 coin reward. 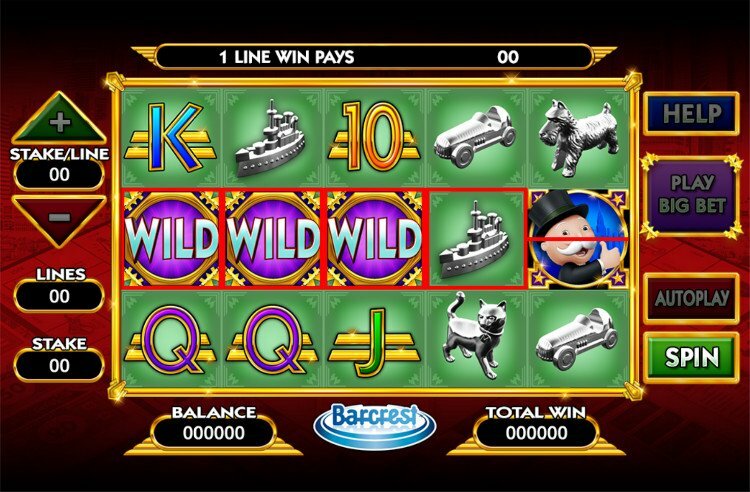 Monopoly Big Event online slot machine is a bold and colorful branded video slot from Williams Interactive (WMS), produced by Scientific Games. Based on the smash hit world-famous Hasbro board game, Monopoly, this 5-reeel, 3-row, and 20-payline slot features the classic character and a few game pieces you might remember. It is also filled to the brim with amazing bonus features, as you will discover in this Monopoly Big Event slot review. 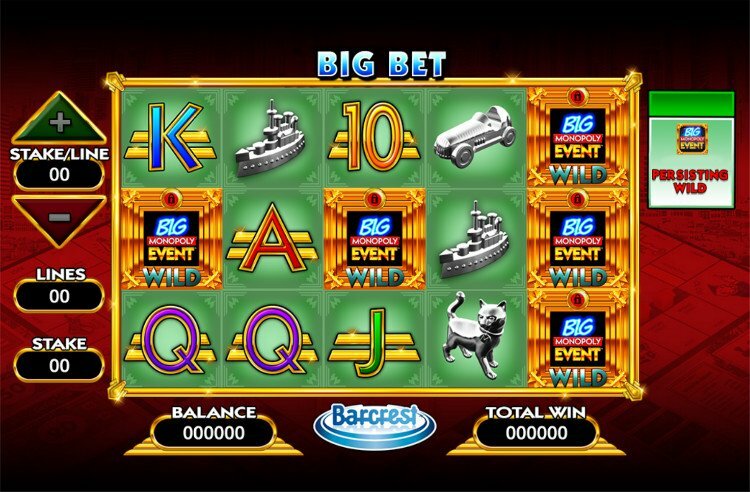 A bright and vivid slot, the Monopoly Big Event game features symbols that include the typical playing card symbols (A, K, Q, J, 10), which are common in most video slot games. Its other symbols include Mr. Monopoly, and silver game pieces including a boat, car, cat and dog. There is also a Wild symbol and a Big Monopoly Event scatter symbol. Although the graphics are nothing spectacular, they do not detract from the thrill of the game. Moreover, the layout of the slot is extremely user-friendly, making it easy for you to pick among options including “Autoplay”, which lets you activate a predetermined number of spins and the “Play Big Bet” button, which gives you access to the Big Bet games. While the Monopoly Big Event slot is not the first Monopoly-themed slot, it is the first for WMS, which now owns the online license. This amazing title is available for the HTML 5 platform for mobile and desktop and gives you the chance to benefit from three thrilling bonus games. Spinning the reels of this game can lead to the activation of an increasing multiplier, locked wilds, dancing wilds, frees spins, and guaranteed wins. In total, there are three main Monopoly Big Event slot bonuses. There is the Big Event game and a Big Bet 20.00 game and 30.00 game. To trigger the Big Event game, the “Big Event” scatter symbol must appear across reels 1, 2, and 5. If, in addition to 1 and 3, two symbols are stacked on reel 5, this will award you with the “Big Event” house sneak preview. However, if the symbols appear on 1 and 3 with three symbols stacked on five, this will award the “Big Event” hotel sneak preview. The main difference between these two games is the house sneak preview reveals the chance card positions of three houses, while the hotel sneak preview does the same, but for three hotels instead of houses. In both versions of the Monopoly Big Event Game, you select community chest and chance cards alternately and these cards are also chosen alternately. Community chest cards can award guaranteed wins and free spins. Three of the same symbol will activate the corresponding bonus. Both Big Bet games are activated by clicking the “Big Bet” button on the side of the reels. When the 20.00 game is activated, a progressive win multiplier applies to the wins on every spin up to a maximum of x5. 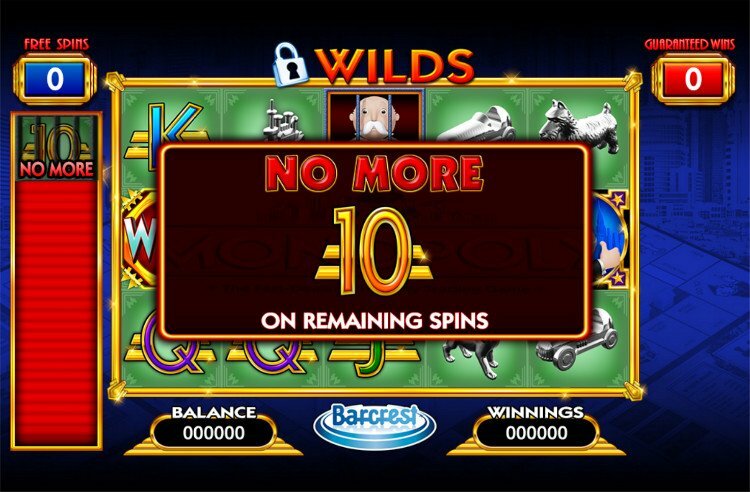 In the 30.00 game, a wheel spins and will result in you receiving a Progressive Win Multiplier (multiplier increases by 1 for up to 5 spins), Epic Spins (a win multiplier of x5 applies to each spin), or the Locking & Wild Big Event feature (the Big Event symbol is wild and sticks for the full 5 spins).